Cut costs and increase effectiveness of social programs? Any government would probably sign up to a deal that combines both right away! This is one of the key thoughts behind the Social Impact Bond. In times of limited budgets and austerity, governments find it increasingly difficult to spend taxpayer money on prevention and early intervention, even though such programs often cost less than future crisis intervention to social issues. Firstly, symptoms have to be dealt with. This leaves little free budget for preventative measures that would eliminate the root causes of a social problem. Secondly, spending for prevention and early intervention are risky because they might prove ineffective. The public sector would have to pay twice: once for a failed attempt to eliminate the root causes and a second time to deal with the symptoms. 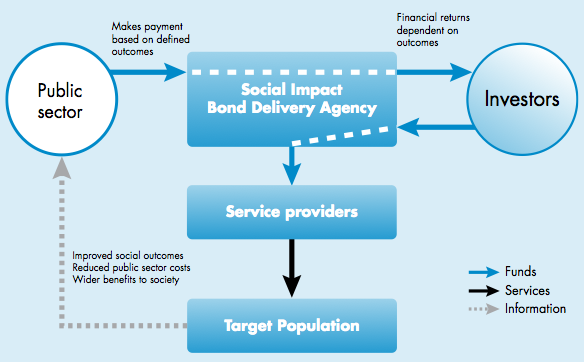 Social Impact Bonds (SIBs) address these barriers to public sector spending in prevention and early intervention contributing to overcome the lack of sufficient and dependable funding for service providers that deal with root causes. Developed by UK-based not-for-profit Social Finance, the SIB concept presents an innovative investment vehicle that is based on a multi-year contract between a bond-issuing organization and the public sector. On the one hand, a bond-issuing intermediary promises to deliver improved social outcomes that generate future cost savings for the public sector. On the other hand, a public sector agency agrees to pay a pre-determined price – a proportion of the cost savings that would result from a particular improved social outcome. Importantly, the government entity would only be required to make the payment if the agreed-upon performance targets are achieved. Based on the contract, the intermediary issues a bond to raise the necessary funds from social investors. The capital is used to equip a set of appropriate service providers with upfront capital to cover program operating costs and work towards improved social outcomes as defined in the contract. Upon completion of the contract term, the performance targets will be measured. If the target was reached, the government pays the agreed upon price and the investors are reimbursed, ideally receiving an interest on their principal. The SIB concept is so intriguing because it has the potential to deliver significant benefits for all parties involved. Taxpayers will see their money be spent effectively as the public purse will only pay if expected results are achieved. The investment risk is transferred from the public sector to third-party investors. Moreover, by focusing on preventative and early intervention measures rather than on costly crisis intervention programs the potential savings can be substantial. Socially minded investors can expect to receive payments higher than their initial investment into the bond, enabling them to subsequently reinvest in further initiatives. The combination of social and financial returns on investment might also attract for-profit investors increasing the capital available for social initiatives. Social service providers can count on a more sustainable and reliable revenue stream to cover their working capital needs as they arise. Fundraising needs less attention and more concerted efforts to work towards achieving the targeted social outcomes are possible. Traditional public sector contracts often are based on outputs rather than outcomes and involve tight specifications on how an objective should be pursued. Within an SIB scheme, social service providers instead are measured by the outcome they achieve instead – incentivizing innovative and more effective approaches as better outcomes increase the amount repaid by the public sector to the investors. Overall, and most importantly, an SIB scheme has the potential to drive positive social change by enabling services that will improve the lives of individuals and their communities – effectively and at scale. Last year, Social Finance kicked off an SIB pilot scheme aimed at reducing reoffending rates of short-term prisoners. A number of socially minded investors provided funds totaling £5 million. 3,000 inmates from Peterborough Prison in the UK will undergo rehabilitation measures provided by a group of social service organizations. With a variety of programs those organizations aim to reduce the reoffending rate by at least 7.5 percent compared to predicted figures within six years. If they succeed, the government will reimburse investors. The payment represents a share of government savings ensuing from reduced recidivism. The higher the savings, the higher the payment to investors, up to a maximum payment of £8 million. The concept of Social Impact Bonds has been met with great interest also outside the UK. New South Wales of Australia already investigated the applicability of SIBs for its context and is likely to implement an SIB scheme addressing juvenile justice and parenting skills for at-risk families. Additionally, the U.S. government has recently expressed interest in using the model, naming it “Pay for success bond“. Seven projects with a budget of USD100 million are under consideration. In several other countries the concept is being explored, for example in Canada. Social Finance provides several opportunities encouraging discussion, improvement and adoption of the Social Impact Bond model. This month, Social Finance ran a series of conferences on the SIB concept. If you weren’t in the UK or are interested to find out more, you may find the SIB webinars on March 21 and April 14 useful. Online you will also find a number of guides to Social Impact Bonds as well as information to specific sectors that might be suitable for applying the SIB concept including healthcare, criminal justice, vulnerable children, and drugs. SIBs might not be a panacea with many social challenges not presenting the key requirements for addressing them with an SIB scheme. However, it is a promising concept that due to its potential to create incentives to increase the effectiveness of social programs and benefits for all involved is well worth exploring. How about applying a Kiva-like model where individuals can become the social investors or even the commissioner of the bond, replacing the public sector? Or why not apply the model in a development context with donors serving as commissioners enabling outcome-focused development, driving innovation and potentially attracting more capital to development? Please become a NextBillion Facebook fan and follow us on Twitter.